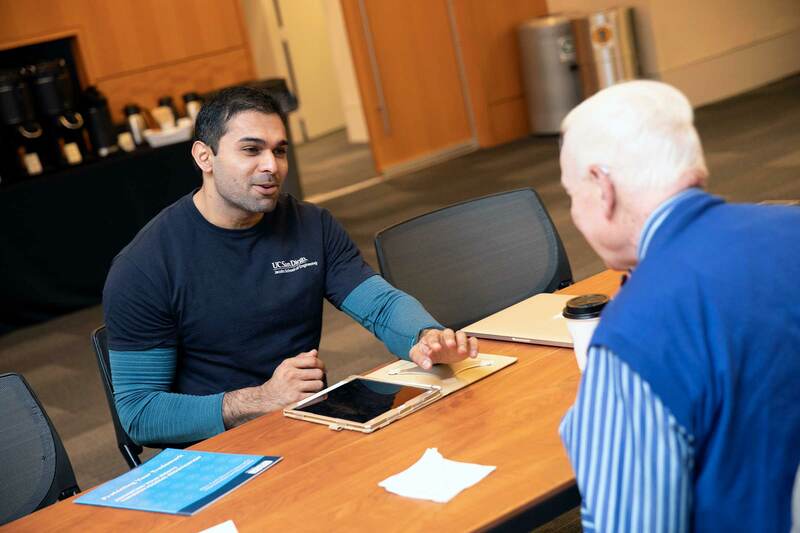 Gopesh Tilvawala, a mechanical and aerospace engineering graduate student at UC San Diego, explains his concept for a steerable microcatheter to judges at the Collegiate Inventors Competition. Photo courtesy of Collegiate Inventors Competition. Gopesh Tilvawala’s path to San Diego spans four countries and four continents. That journey led him to UC San Diego and the pursuit of a Ph.D. in mechanical and aerospace engineering with a focus on medical device technology. For the past four years, he’s been working to develop a first-of-its-kind catheter that can be remotely controlled to navigate the tiny arteries in the brain. In November, Tilvawala’s efforts were recognized with the People’s Choice Award and second place overall at the 2018 Collegiate Inventors Competition, organized by the National Inventors Hall of Fame. His device—called Neurotendo—has main applications in diagnosing and treating cerebral aneurysms, which are bulging spots in an artery near the brain. One in 50 people in the United States have an unruptured cerebral aneurysm; when they rupture, they’re fatal 40 percent of the time. Tilvawala’s goal with Neurotendo is to be able to diagnose and treat these aneurysms earlier, safer and at less cost. Tilvawala’s path to UC San Diego is full of twists and turns. Born in India, raised in Kenya and a college student in Australia, he followed his Ph.D. advisor, Professor James Friend, when he transitioned from RMIT in Melbourne, Australia, to UC San Diego. Tilvawala, who speaks five languages, said one of the things he most appreciates about research is its universality. Tilvawala is a graduate student in the lab of Professor James Friend. Tilvawala said he appreciates the university’s focus on translating research from the lab into real world applications, and noted the confluence of people and infrastructure that make it uniquely capable of doing so. 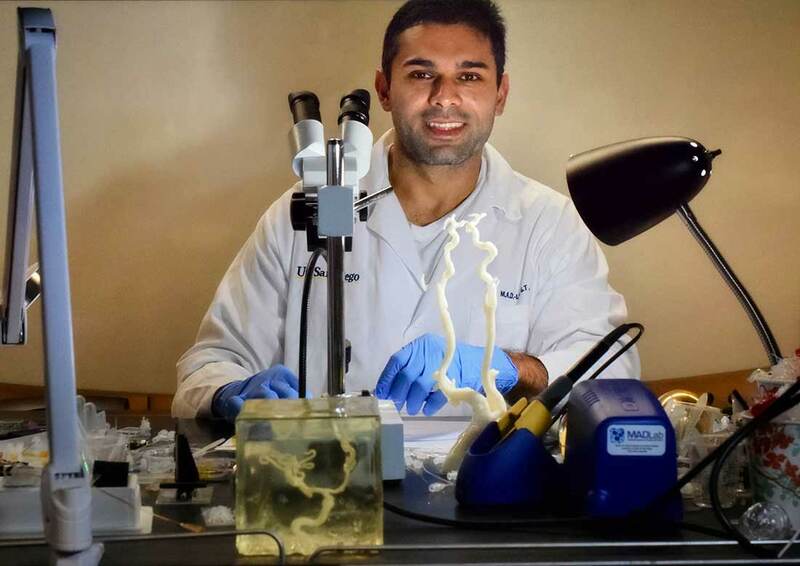 Tilvawala said the fusion between departments and disciplines has been key in getting his device to this stage—he’s collaborated with researchers from neurosurgery, radiology and vascular surgery, all of whom made key contributions to ensure the device was not only functional, but solving the right problem. Tilvawala received support and mentorship from Vish Krishnan, Ricardo Dos Santos and Kimberly King, from the Institute for the Global Entrepreneur—a collaboration between the Jacobs School of Engineering and Rady School of Management, with a mission to educate, train and empower engineers to become changemakers and technical leaders. He was also mentored and supported by Alexander Norbash and Alexander Khalessi from the UC San Diego School of Medicine. Tilvawala named the device Neurotendo because it’s resembles a Nintendo game for neurosurgeons. While he’s still developing a fully functional prototype of Neurotendo under the guidance of his advisor, Tilvawala said having a real-world application of his research has been key since day one. 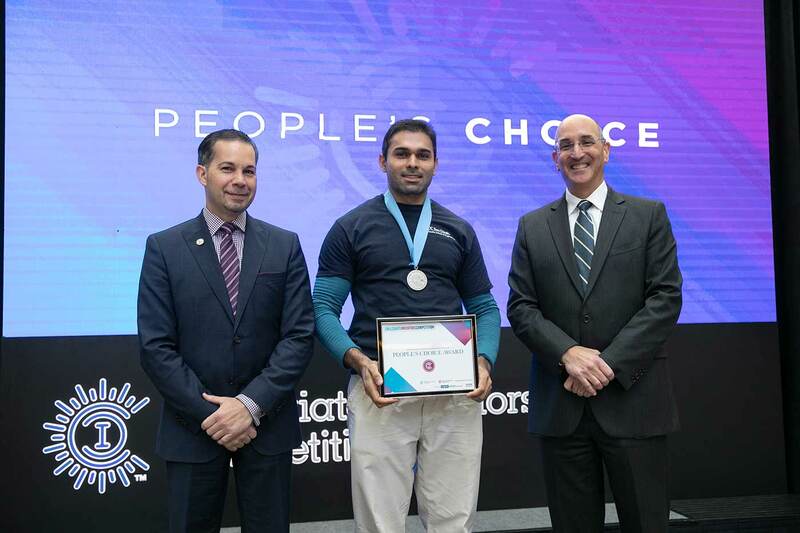 Tilvawala accepts the People's Choice Award at the Collegiate Inventors Competition from (left) Anthony Scardino, USPTO chief financial officer, and (right) Drew Hirshfeld, USPTO commissioner of patents. Photo courtesy of Collegiate Inventors Competition. Neurotendo is poised to do just that. There are no brain catheters on the market that can be remotely controlled like Neurotendo; the current state-of-the-art involves surgeons using one hand on a guidewire and the other on the catheter to insert and guide the tube. Tilvawala’s research makes it possible to remotely navigate the small and twisty arteries near the brain, reducing surgery times and creating a safer and more effective procedure. He used his knowledge of hydraulics, coupled with micro-electronic mechanical systems (MEMS) and soft robotics, to make a medical device with much wider applications than cerebral endovascular surgery alone. Neurotendo could also be used to navigate a catheter through the urinary tract, heart or any other tight, twisty spot that doctors need images of or to operate on. By extension, it paves the way for the next generation of small, dexterous surgical tools with unprecedented maneuverability. With the Collegiate Inventors Competition win under his belt, Tilvawala said he’s more motivated than ever to continue creating solutions to today’s pressing challenges.